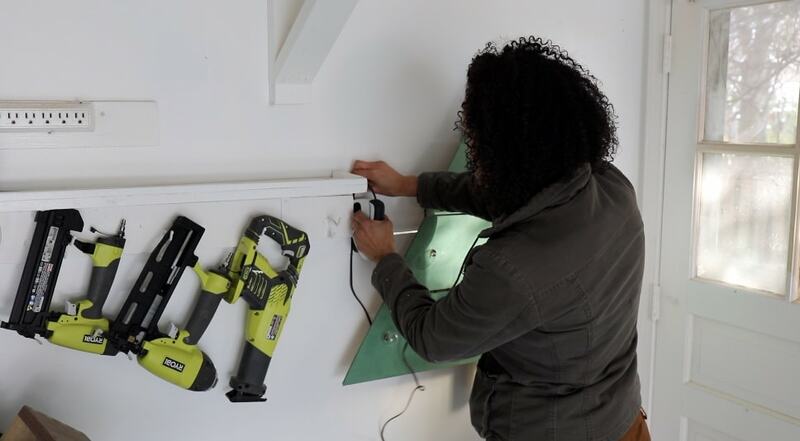 This project is brought to you by Arrow Fastener. The project and all opinions belong to Thrift Diving. If you knew me in real life, you’ll know that I rarely decorate for the holidays. I typically throw up a little Charlie Brown tree and “holiday decorating” gets quickly checked off the TODO list. But I secretly love the holidays. I decided that this year I would make more of an effort, starting with my garage that I’m in the midst of making over. I spend a lot of time in there and wanted to bring some of the holiday cheer to my workspace. Since I don’t have a lot of space for a real tree (and admit it–a real tree would look ridiculous in the garage! 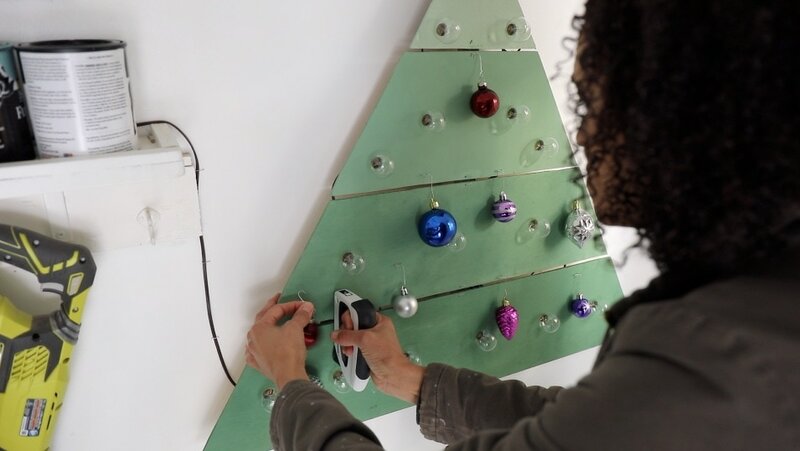 ), this space-saving, wall-mounted wooden Christmas tree is perfect for cozying up a wall for the holidays! I made mine about 7.5″ wide. 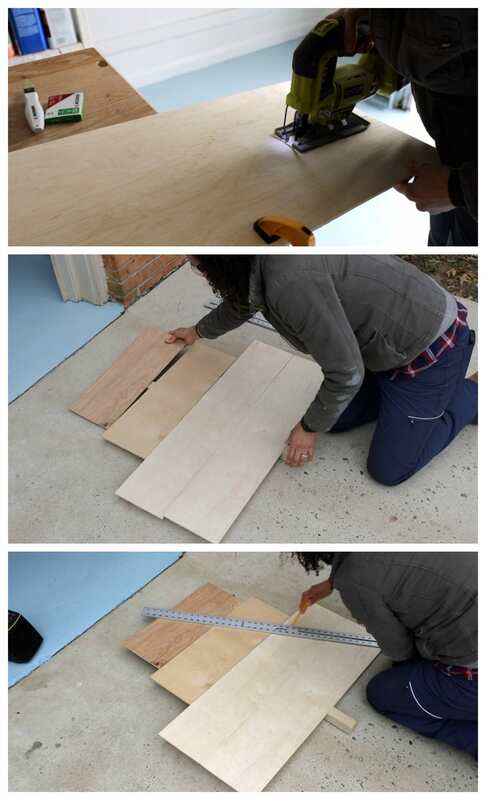 Placing them a 2″x 2″ board, I needed four planks. Using a straight edge, I drew a triangle in the shape of a tree, from top to corner on each side. 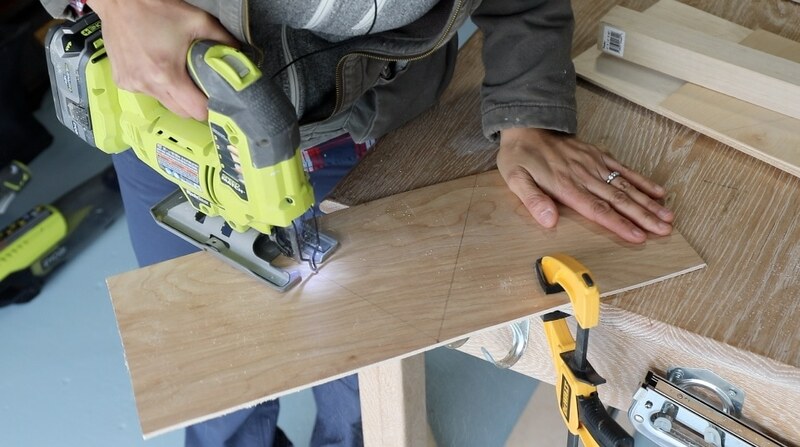 Using your jigsaw, cut out the tree on the lines you just drew with the straight edge. 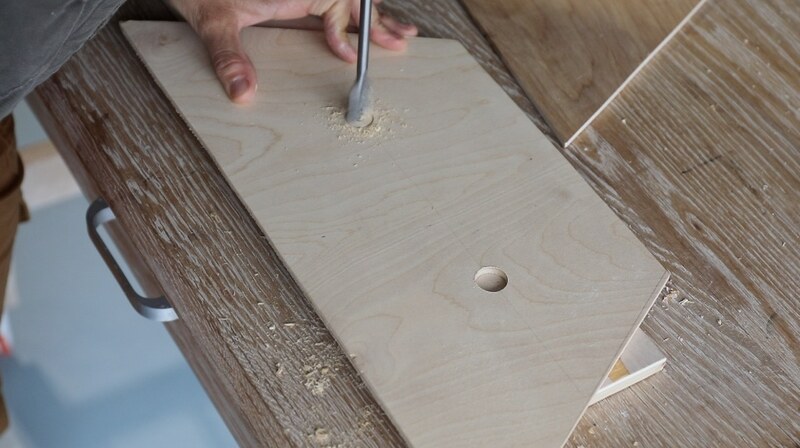 Be sure to use a sacrificial board underneath so you don’t drill a hole in your table. 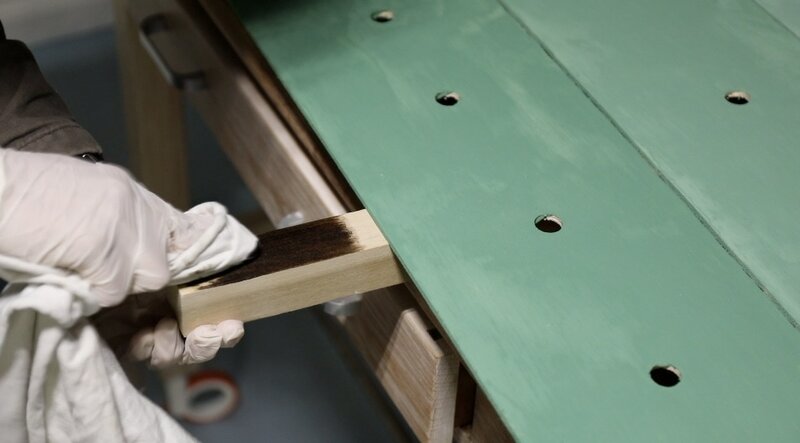 Plus, it helps to prevent tear-out on the reverse side when you use a sacrificial board. I tried to make the holes evenly spaced. 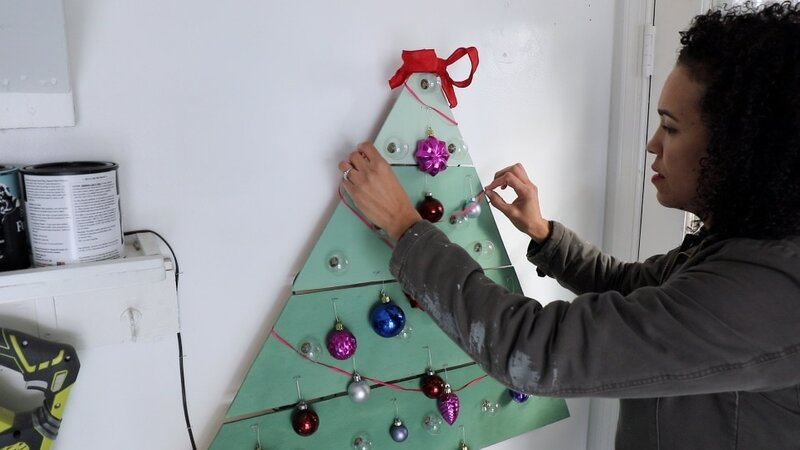 STEP 4: Paint Your Tree! 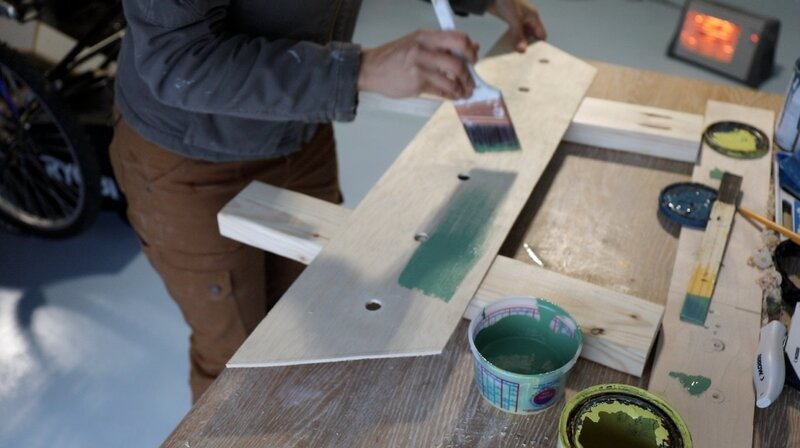 (You can secure the boards to the 2″ x 2″ at this point, with glue, brad nails, or staples. 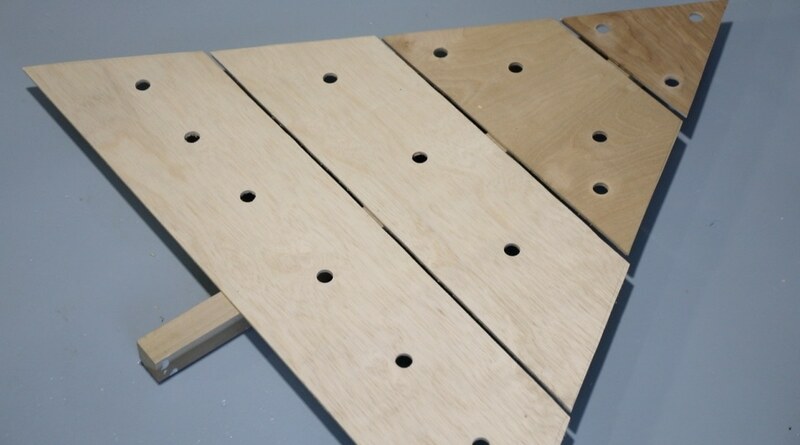 I chose to paint the boards, first, but it’s best to secure them in case you want to disguise the staples or nail holes). Painting is the fun part! I didn’t have any green paint, so I mixed a yellow and blue together and made my own green. Then I added some white and created an ombre effect to make it more interesting! I used dark wood stain to create the trunk of the tree since I didn’t have any brown paint! I bought the lights from the thrift store months ago and held on to them, knowing a great project would come along. 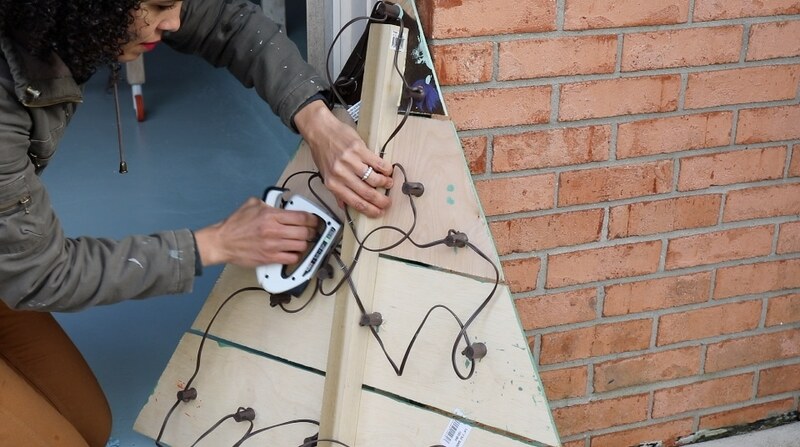 And the only way this really works is to use thin wood so that the light bulb and the socket make a connection so they’ll turn on when plugged in. Just don’t screw them too tightly or they’ll crack! 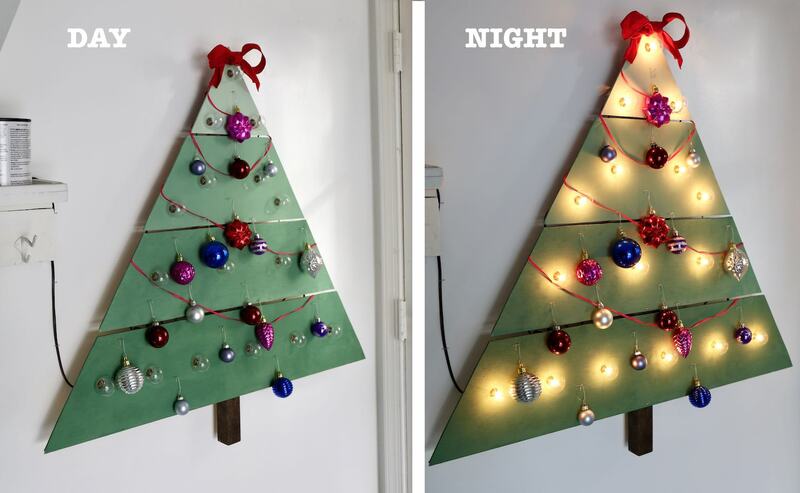 This Christmas tree is getting hung on my garage wall, so there wasn’t space for all that bulky leftover electrical to just hanging there. 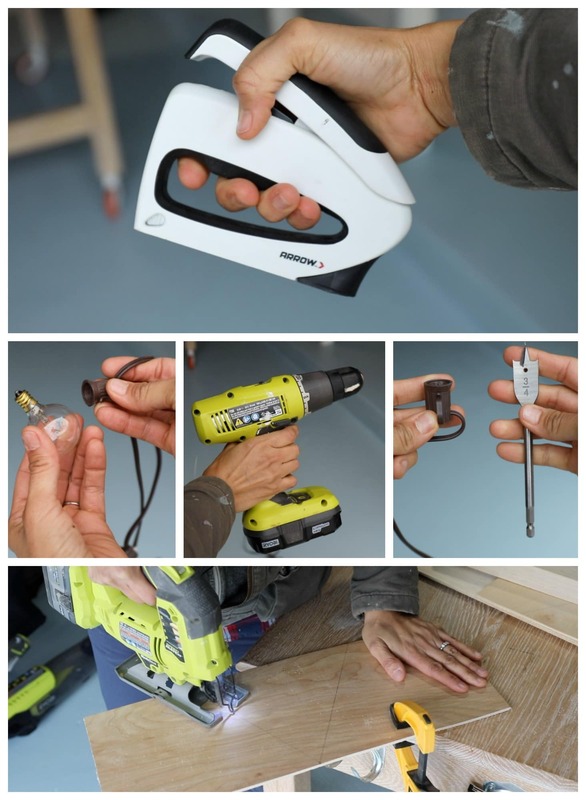 The Arrow Fastener TruTac was the perfect tool to secure it in place. 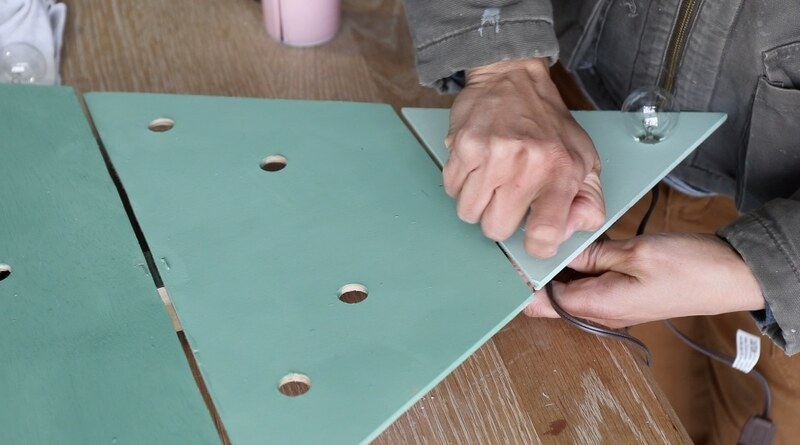 It’s pretty lightweight and allows you to push it in versus squeezing it (if you’ve got small hands or can’t handle bulky staplers, this one is for you). I just had to be careful I didn’t put a staple through the cord! GASP! Now that the cord wasn’t in the way, I could attach the D-ring and hang the picture hanger on the wall. (Don’t mind the ugly back of the tree! This was scrap wood I was using!) :). These lights had a super long cord that I didn’t want just hanging around at the bottom. So I used the stapler to snake it up the wall and neatly hid the excess stapled cord behind cans of paint, then plugged it in. 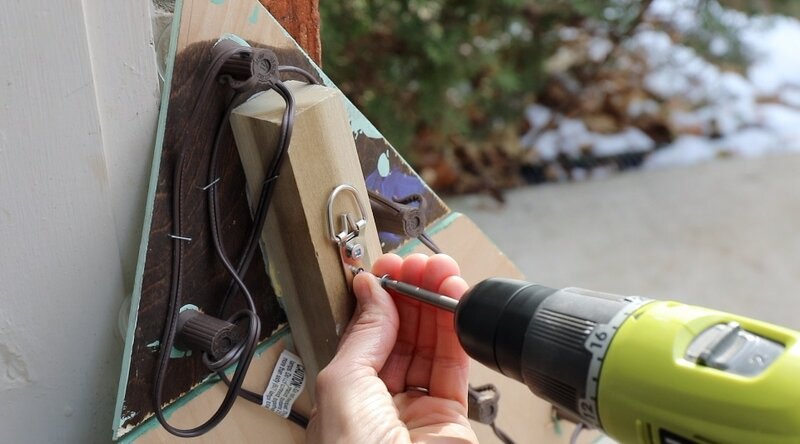 STEP 9: Add Staples as Hooks! 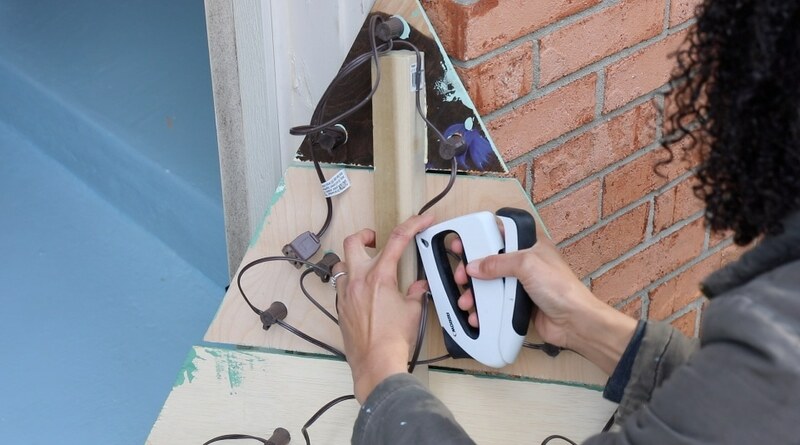 The trick to this was to not press the TruTac™ stapler all the way against the wood. If I left a little space between the wood and the stapler, the staples wouldn’t go in all the way and I could place them randomly on the tree and hang Christmas ornaments off of them! I also added a bow and some other ribbon for trimmings! I love how it looks at night! 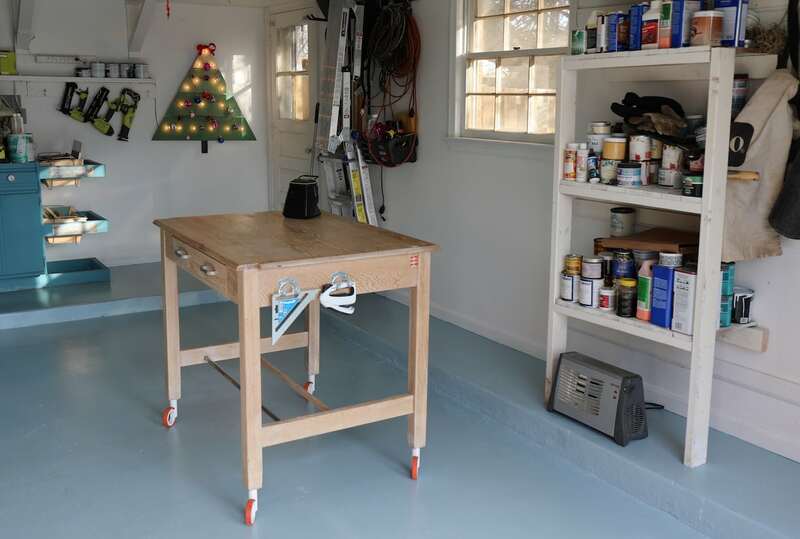 I’ve painted the garage floor, walls, and ceiling, and nex,t I must get my tools set up on my workstations. I’ll admit that I’m looking forward to having a functional, cozy place to create! Be sure to check out the TruTac™ Arrow Fastener stapler on their website! So what do you think?! 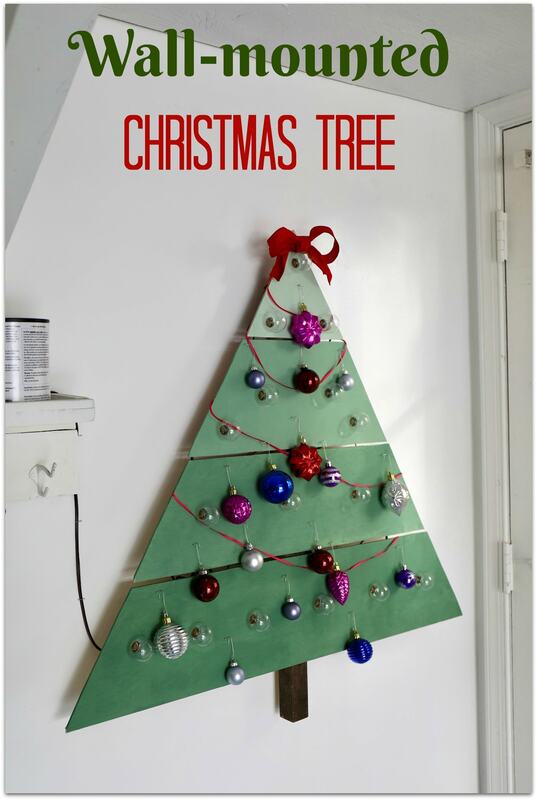 Have you ever thought about making a wall-mounted Christmas tree for a small space in your home for the holidays? « Gorgeous Furniture Finds at the Thrift Store! That turned out great. I bet it looks gorgeous all lit up at night. Thanks, DIY Guy! These are really fun to make. 🙂 Happy Holidays! I searched far and wide last year for a wall mount tree plan as the perfect spot for the tree in my little house is about 12″ wide. While your nice tree doesn’t suit my needs [a year late and must use real greenery] it is adorable. 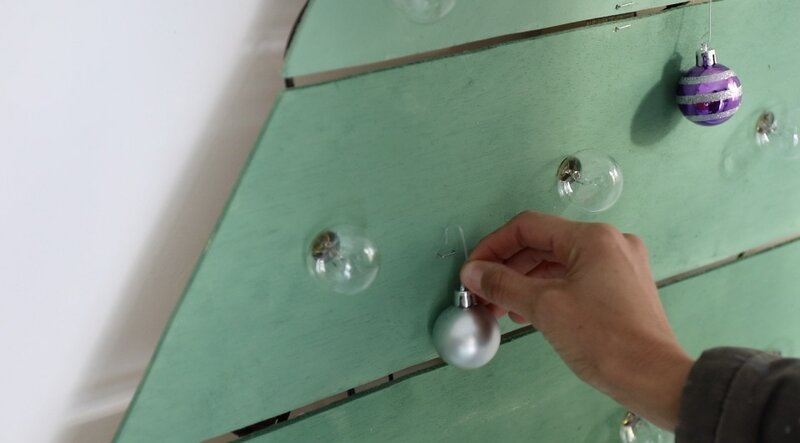 Love the staple ornament hooks and those lights are too cute. I came up with a PVC frame painted with camouflage green spray paint. 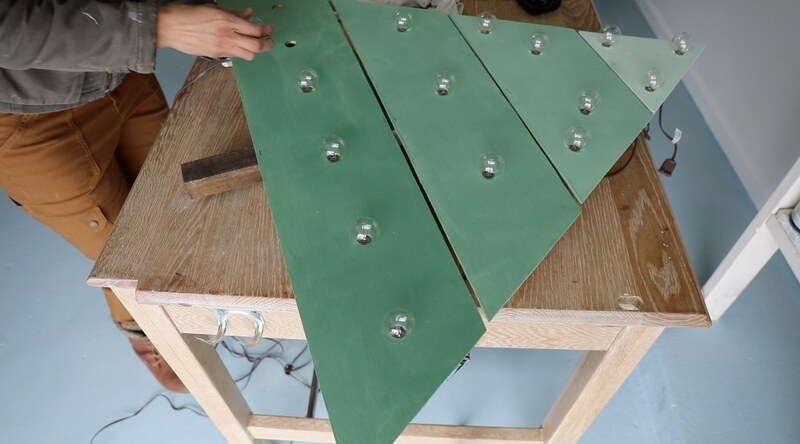 Plan is vertical ‘trunk’ with horizontal pairs of ‘branches’ using regular PVC pipe and fittings with foliage attached with wire. Last year the wired on garland wanted to roll to the bottom so I drilled pairs of holes for the wire, hope that fixes that. Waited too long this year and am making my own garland from branches trimmed from Christmas tree lot trees and a large juniper in my yard. It dries out fast because nothing is in water so don’t want to put it up too early. Once garland is on I can add more twigs and decorate as usual. Really looked nice last year, it’s going up tomorrow so we shall see. Oooh, I would love to see that, Kathy! That sounds pretty creative! Happy Birthday and enjoy this time with your family. What I learn at 40 is you are not to old to learn new things and the shy is the limit enjoy the ride. Try something new every month. Hi, Tammie! Awww…thanks! We just got back on Saturday night from our trip and it was divine! Soooo relaxing and Costa Rica is simply gorgeous. It’s definitely a place I’ll be visiting again in the future! Thanks for that advice on turning 40. I agree wholeheartedly! Whenever I hear of people trying new hobbies and skills, it makes me happy because for every person who’s trying new things, there is someone who has an excuse that they’re too old to learn new things. That’s false! 🙂 Thanks for commenting!! Happy Birthday! My 9 year old and I love love love watching your videos and figuring out what to make/re purpose next. I love the tree but it’s too much effort for me. I’ll just put up a small tree and call it day (with a 1 year old, a cat and a puppy–no tree has a chance in our house). My mother died a month before my 40th birthday (41 now) and the birth of our 3rd. We just took a trip to Europe as a delayed celebration and it was awesome. I’d say after turning 40 with such a big loss, I try to enjoy more unknown experiences (like flying lessons form a Groupon!). I’m also less worried about what people think and less beholden to my kids endless demands 🙂 Mama needs free time too. Hi there, Casey! So sorry to hear that your mom passed right before your birthday. 🙁 Enjoying the unknown experiences is so important, as well as the relaxing experiences! It’s funny–as we were in Costa Rica, I compared that vacation to one I would have wanted to have 10 years ago and it’s completely different. Now, it’s about family time, building memories, teaching kids the value of traveling and new experiences and different cultures, compared to a “younger” vacation where it’s about choosing places with good nightlife! Wow, flying lessons! That’s awesome! Sounds like 40’s are going to be awesome! First….. Happy Birthday !!! ????. Hope you are having Great weather and a lot of fun in Costa Rica. I love your Wall Christmas design. Any shape/design could be used and lights added. Then you could add it to your deck/patio area. I’m putting this in my favorites “pile”.